If you had to choose a destination that embody the magic of Morocco it would be the Sahara desert it is definitely an experience everyone should have at least once in their lifetime. It is a journey well worth the effort and you will have fond memories to last you forever. Imagine yourself on top of a camel, trekking through the Sahara desert. There is nothing around you and all you can hear are the footsteps of the camel on the soft sand.The Best of Merzouga proposes a few yet amazing tours in Morocco so that you can take advantage of a fabulous travel destination such as Morocco. 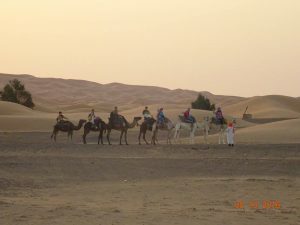 Adventure yourself in Sahara Desert and take a camel trek in Merzouga Dunes, south east of Morocco. Camel trekking is a way of experiencing Sahara Desert in a whole different way.All our desert tours include riding camels into the Sahara dunes Erg Chebbi camp for an overnight stay we do offer standard tents and luxury tents depends on clients request.Our team are always ready to welcome our guests in a professional way to make sure they have a life time experience in sahara desert. all our tours starting from all over Morocco, are including atleast one night in sahara desert , so enjoy your stay in Morocco with us.